We have a 20+ year history with the Mauna Lani Point. We know this place and have stayed in many of the 1 and 2 BR units over the years. All of the units have their pluses and minuses that relate to remodeling, views, location and amenities. This one has it all. In fact- we hesitate to post this review, since we would like to keep this a secret. Remodeling/dcor: the dcor and furniture were first class in every room. The master bedroom was spacious and had a section cordoned off as a fully stocked office with a printer that allowed me to work while away. The master bath had a large walk-in shower with a glass brick wall- very classy. The only drawback was a lack of a table on the lanai, since we prefer to eat outside. View: excellent ocean view from the 2d floor that faced the signature 15th tee box and some of the 15th green. Sunset was straightaway. Location: the C building is a quick walk to the pool and Bar-B-Q area. Only E and D are closer. The pool is largely deserted and perfect for an afternoon nap. Amenities: we actually like to cook local foods while on vacation, so the kitchen was a very pleasant surprise. It was also first class all around. The cookware, cutlery and everything else made us feel at home. Everything else in the unit exceeded our expectations. Dont tell anyone- theyll all want to go here. In addition, Wendee was very prompt and professional in answering our questions and addressing our needs. 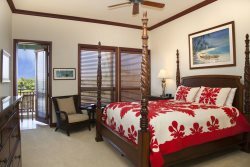 "This quiet Kolea unit has a lovely view out toward Anaehoomalu Bay. Access to the unit was easy and speedy and we got immediate attention when we noted a couple of minor issues with a bent key and temporary elevator shut-off. There were beach toys, chairs, and lots of towels to use and the unit was equipped with everything you might need. We also got the use of a pack n play for our 2 year old grandson, courtesy Kohala Luxury Rentals. Its also in easy walking distance to the Kings Shops and Queens MarketPlace. But the best part was the Kolea beach club which had a sandy bottom pool only 18 inches deep (and little waterfalls) that our grandson loved and the easy walk to Anaehoomalus beach from the club!" Wonderful base camp for a Big Island vacation Wonderful condo in a lovely community. Well equipped kitchen with modern appliances including a coffee grinder. The ceiling fans allow you to have the widows open so you can enjoy the island breezes. The mattress in the master bedroom is top-notch. The balcony with a great Grillmaster grill made for some lovely dinners. The pool that is part of the complex is quite nice. The condo is nicely decorated with an Island motif. This is a fantastic place to stay while visiting the Big Island. Luxury Unit - Very Quiet - Clean - Well apportioned - Gated Community - Ocean Club This is a luxury 2 BR Unit in a gated community, very quiet and in excellent condition. The unit was modern, fully furnished, and very clean. Amazing Ocean Club (pool, sand bottom hot tub, restaurant and bar). Convenient to shopping and public sand beaches. Property Management is great to work with. Very responsive. We loved are stay. Wonderful stay in great Townhouse (BC Canada) My wife and I returned from Hawaii on February 14 2012, after a wonderful five week stay in 2001. The accommodation is perfect for a couple but could easily accommodate two couples. It is ideally located close to the most peaceful swimming area/s ( separate childrens and adult lap pool) that we have ever experienced in Hawaii. It also has a fully equipped and fully air conditioned work out room if you feel energetic. The Town house is very well equipped for cooking and dining at home and is within easy walking distance of the local grocery store and a short drive to the gated private beach. The new owner showed great concern for our comfort and enjoyable stay and there is a local Manager always ready and willing to help if need be. We certainly hope to stay at 2001 in the future and would certainly recommend this property to friends without hesitation. August Vacation We stayed at this townhome in the Mauna Lani Resort for 10 days last month. Our group consisted of me, my husband and our two children (ages 11 and 8). Wendee is the property manager and she handled our reservation. At one point the air conditioning went out and it was fixed within the hour. She was responsive on one other issue we had. There was a bug in the house but we might have let it in while grilling dinner. Its hard to know. We only saw the one bug and pest control came the next day in the morning. The condo has everything you need and the location is terrific. The kitchen dishwasher did not work correctly. The soap did not dissolve. I meant to mention this to Wendee. So, I mostly hand washed the dishes which was not a big deal. The patio is fairly private and we enjoyed watching the sunset from the upstairs master balcony. We would definitely stay at this property again. Since Wendee is overseeing the property it is not truly VRBO. I think it is important to have someone to contact in case of issues. Great Experience Sep 2012 Our family of two adults and two children had a great experience staying at Kulalani 2001 this Sept for two weeks. The unit felt new, clean and spacious - and had most of things we were looking for to make our stay really enjoyable. The kitchen had everything we needed - no surprises - nice. The location was quite good for all that we wanted to do and see. Pools at the complex were perfect for play and for lap swimming. The various owners at the complex were extremely friendly/helpful. The coolers, chairs and boogie boards at the unit were much appreciated for our many trips to Hapuna beach. The property manager was extremely helpful and responsive before and during our stay. The listing and the photos for this rental - were as we expected. Little things that could be improved, and they are quite minor - a second BBQ tank as we ran out of propane, the snorkel kits at unit were nice but missing an item or two, a few more family games in the unit would be ideal. When we come back to the big island - we will want to stay at this same rental unit !!! We enjoyed swimming with the dolphins - thank you Jenna/Amanda from Dolphin Discoveries. We took Surfing lessons from Austin at Kona Surfing Co - what a great teacher ! Hapuna beach was our favorite place to enjoy sun, boogie boarding and snorkeling with turtles. We were told the Waikaloa Resort Luau was the best on the island - and we 100% agree. The Ike Trail hike at Kilauau volcano was a highlight for us. And seeing the starts from the top of Mauna Kea is something we will never forget. A Perfect Place To Stay !!!!!! Had the pleaseure of staying in this beautiful townhome for a week before Christmas. Wendee was an absolute pleasure to deal with and was always quick to respond to any questions ! This townhome is Perfect ! A short walk to the beach, to the grocery store and right next to the beautiful recreation facility make this one of the best places to be. Inside there is everything you may need and the decor and furnishings are excellent. The lanai gives you the chance to bbq and provides you witha little privacy as well. Would highly reccomend this townhome and we have already talked to Wendee about returing again this spring. Mahalo Wendee !!!! The location was wonderful! Closely proximate to the pool & gym, wonderful backyard area and very quiet complex. Inside, when we arrived, all was in order and we felt at home immediately. Wonderfully appointed and very clean. The owners thought of everything including multiple keys for the pool area (gated), multiple remotes for front gate after hours, as well as pass cards to the private beach. Towels were at the ready, and in the garage there were noodles for the pool. The pantry had an ample spice cabinet, and it was great as it seemed past guests (and us) added to the pantry and condiments. We were set to cook - just add veggies & fish! Wonderful space - will be back again! Luxury Unit. Quiet, Modern, Clean with Ocean Club After our first week in this gated community, we were lucky to be able to stay for two extra days in this luxury 2 BR Unit. It is part of a very quiet gated community, and is in excellent condition. The unit was modern, fully furnished, and very clean. Amazing Ocean Club (pool, sand bottom hot tub, restaurant and bar). Convenient to shopping and public sand beaches. Property Management is great to work with. Very responsive. We loved are stay. First class. The condo and grounds were great - well maintained and the condo was very well equipped and beautifully decorated. BBQ and deck were great. My only problem - I have a bromine allergy- we inquired from pool attendant if bromine was used in the hot tub - he assured us it was not. Well, after using the hot tub once - within 24 hours I had a rash over my whole body. Rather annoying, as I always ask - also rather uncomfortable in the heat and humidity. Yes, we would recommend this property to friends or relatives. Fabulously fun! Great villa! Nice people! yummy restaurant on property with a swimming pool and an amazing view of the ocean. Great location overall - we could walk to the store and to the Hilton and to shopping. Beautiful weather. We will definitely come back! We had the pleasure of being the first guest here at 18D. What a lovely and relaxing place to rest our mind, body + soul. Every room was beautifully decorated. The monster sony TV kept us entertained + and up to date on currents events. We survied the Tsunami warning of 2010. A heartfelt thanks for your wonderful piece of paradise. Hello! After a long flight, what a wonderful and refreshing place to come "home" to, your condo is beautiful! Youve done an excellant job of making sure all needs can and have been taken care of. It is evident that you spent a lot of time making sure your guests are completely satisfied. Thank you for the lovely decor, the well-stocked kitchen, very comfortable bed,spacious + well-appointed dinning area, living room, beautiful bathrooms, huge TVs + entertainment systems, full size washer, dryer, refrigerator/ freezer, bath towels, etc! Also the breeze-the fresh sweet air circulates throughout the condo with all of the lovely large windows! No need for the A/C!! You have chosen an exquisite area!! The grounds are exceptionally beautiful! The Ocean front pool area and grill are fabulous!! The food and service at the Ocean Club Bar + Grill was excellent all the time! We can see why, youd want to spend a lot of time here your self. Thank you for sharing your Paradise with us!! Youre made coming to this island very special!! WE WILL BE BACK!! The sign of a wonderful vacation is not wanting to go home. Where we always feel that way when we leave Hawaii, this time it is more pronounced as in our time here Halii Kai 18D has felt like the perfect retreat and our home away from home. As vacation rental owners we so recognize and appreciate the tremendous attention to detail, well stocked kitchen with so many extras that make a stay truly special. The photos dont begin to show the fabulous layout and the quality of the furnishings and amazing artwork and decor. Most rental units are sparce and generic, this home is rich in tone and texture, generous in the creature comforts and the resort itself leaves nothing to be desired. We are sure to return and will share our experience with friends, family and clients who are looking for a truly wonderful home away from home. In appreciation and awe of your wonderful home. We just wanted to let you know what a wonderful stay we have had in your villa!! It is decorated beautifuly and everything you could want is here!! The complex we love because it is so private and quiet - we especially enjoyed the Ocean Club Grill - the food was great and they make the very best MaiTas! The views are gorgeous and we hope to be back next year. Also we have friends that will be planning a trip in November and I will certainly recommend they get in touch with you. Thank you again for sharing your home. Thank you so much for welcoming us into your lovely home at Halii Kai. We spent a wonderful 10 days enjoying the beautiful Big Island. Your home is absoloutely gorgeous and so well equipped with everything we needed. The original artwork and Hawaiian decor throughout was beautiful. We enjoyed many breakfasts and dinners on the lanai and enjoyed the private BBQ. The beds were so very comfortable and the bathrooms amazing. The 3 big flat screen TVs, cable and internet provided us with all the comforts of home. We especially enjoyed how quiet your condo is as is the entire complex. The Halii Kai complex is more beautiful than we could imagined. We spent a lot of time at the pool overlooking the Pacific and saw many whales jumping close to shore. The bar and grill was fantastic too. Thank you for your hospitality and we hope we will be able to visit again in the future. We had such a nice family holiday with many treasured memories. Thank you again.!!!!5STARS!!! Really great! Everything OK!!! Everything as new, well and lovely furnished... Wonderful ocean front clubhouse, on-site restaurant, pool-side bar, and unique sand-in spa. the listing description accurate regarding the location? The listing photos accurately reflect the rentals appearance and amenities. The property was clean and well-maintained. The owner was really helpful in answering your questions or concerns. We recommend this property. Nearby activities, attractions and restaurants recommended: Waikoloa is a lovely place to stay and as start for the visit of the whole island. There is a lot to see (Volcano, Mauna Kea, the island by air, round trip of the island by car....). It was a wonderful stay for us! Our Fabulous Hawaiian Vacation The property was all that we expected and the description and virtual tour that we watched before making our choice was very accurate. We liked the location of this property and its close relationship to the tennis courts and the pools, which were both very nice. The grounds surrounding the location and property are exceptional and very pleasant. The location is within walking distance of the Hilton Hotel and we liked this very much. The service we received from Wendee was exceptional and very responsive to our needs. We definitely would come again. We had a fabulous time at the Big Island and especially at the 4F KOREA CONDO. It was everything we expected and more. It was an ideal location for our needs both for the beach, pool and ocean. The restaurants and shopping were convenient. Thank you again, Bob and Peggy. This was our third stay at the Kolea property, and this was the best condo yet. Very well appointed, roomy, and a spectacular view. Easy to just lay back and spend the whole day watching whales, boats, and ocean. The sun seems to always shine in this area, even when its raining everywhere else on the island. Kolea is a quiet, gated community, walking distance to some great restaurants and shops. We had some minor maintenance issues during our two week stay, but the management was super responsive and took care of problems promptly (thanks Wendee). We held back one star because we thought the unit could use a little sprucing up, specifically carpets and lanai furniture pads. We were told that some of this was already planned. This was not enough, however, to detract from our wonderful stay in this gorgeous condo. Great unit, gorgeous views Everyone (age 8 - 70) enjoyed our stay in 4F. The unit is laid out well for different family members. We loved the huge lanai, dining table and the well-stocked kitchen. There were lots of extras throughout the unit that made our stay even better. It was nicer than the photos led us to believe. The rental coordinator was super easy to work with. This was our second time on the Island but the first in Waikoloa. We liked having the grocery store and shops so close yet the property was very quiet and relaxed. We will rent this unit again! Stunning Property!! We had a lovely time on the Big Island and this property certainly helped make this an extraordinary holiday. The condo is beautifully appointed, exceptionally clean (and we are very picky in this department!) and there is not a single detail or amenity that is overlooked. The overall Kolea property was also very well maintained, quiet and in an excellent location - close to amenities such as shops, the beach and a short walk to the lovely Kolea pool area. Wendee and the owners were extremely helpful and quickly responded to any communications or questions. I would absolutely recommend this property to anyone visiting the Big Island! !